The Laserfit® lens is known by patients worldwide from over 40 countries and all 50 States across the USA. It is the only 100% Digitally Made and Non-Invasive Scleral lens system available. They are highly effective for complex vision issues such as keratoconus & corneal damage resulting from eye surgery such as LASIK Complications and dry eye disorders. We are dedicated to improving quality of life for patients with the fabrication, design, and fitting of next generation lenses that can be worn comfortably to provide the best possible vision. No two eyes are the same, so why should you settle for a generic contact lens? Our lenses are custom made to match your own unique eye and to counter each specific corneal aberration. Our patented Wavefront optics are unmatched. No other lens system comes close. We regularly achieve better than perfect 20/20 vision for many people with complex vision challenges. 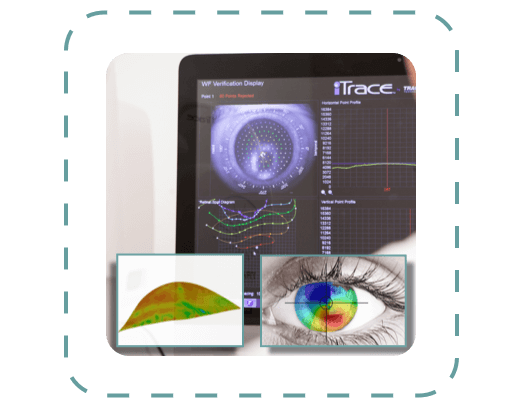 Laserfit is the first scleral system based on OCT laser-mapped topography, and the first non intrusive technology to precisely map the surface of the eye. No trial lenses or messy molding techniques are used. 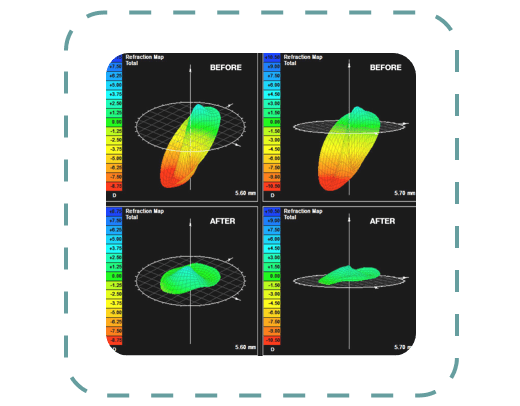 More vision aberrations are corrected by Laserfit® than any other lens available. We live through our eyes, don’t let corneal disease stop you from living. The main problem behind poor vision in keratoconus, failed LASIK, corneal transplants and other conditions is NOT nearsightedness, farsightedness, or astigmatism. That terminology is old and obsolete. We now talk about aberrations such as COMA, SPHERICAL ABERRATIONS, TREFOIL, and many more. These aberrations exist in most eyes, but are present in such low amounts that they are usually unnoticeable. In some corneal conditions such as keratoconus, RK surgery, and LASIK, they are increased to very high levels, often representing 50% or more of the blurred image. The result of these aberrations are ghosting, smearing, halos, glare and double vision. Higher Order Aberrations are much more effectively addressed by our unique wavefront technology. While most RGP lenses correct some higher order aberrations passively, what is leftover is still often unacceptably high. We treat the rest using our patented wavefront-guided optics. 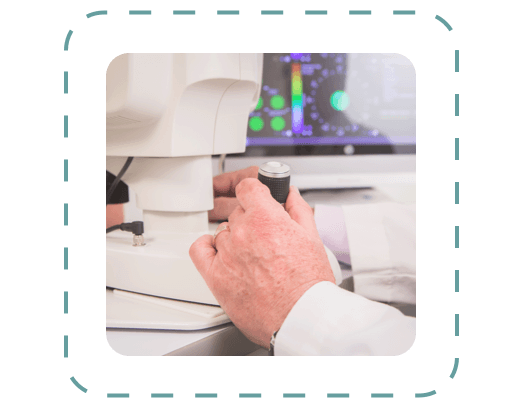 Using the readings from our aberrometer, many complex calculations lead to the creation of optics that are ground into a scleral lens surface and act to cancel out higher order aberrations resulting in even better vision. It is not uncommon to record vision as good up to 20/10 in many of our patients. We have years of clinical experience with this technology. Dedicated 1-on-1 sessions underpin the LaserFit® Scleral system. With new lenses arriving daily from the lab, even the most complex and difficult fits are completed in a short time frame. Each day, if required, newly fabricated lenses incorporating enhancements from the previous day’s data are made. The fit, comfort and quality of vision are re-evaluated and the process is repeated until the patient and doctor are satisfied or until no further improvements are possible. Individualized personal attention ensures that adequate time is available each and every day to evaluate, refine and adapt each individual’s 3D computer model for next day manufacture. Since scleral patients’ daily visits only require a small portion of each day, they are then free to go about their day sight-seeing or shopping while we do the heavy lifting behind the scenes. The majority of scleral lenses are fit using a trial and error method that is anything but sophisticated. Some older methods involve the use of putty in the eye molding compound, the idea of which may not appeal to all patients. Our digital fitting process creates a non-invasive three-dimensional digital “mold” of the surface of the eye. Using this model, a custom lens is designed to perfectly match the shape of the eye. Once a lens is designed to fit the digital model then we are confident that it will fit the actual eye. The end result is a comfortable, non-rotational lens that serves as a stable platform for the aberration-busting optics which restore quality of vision. Decades of Experience fitting complex lenses, combined with our unique patented technology is what separates us from the competition. Dr Gemoules, the pioneer behind the design, performance, and manufacture of the LaserFit® Scleral System has spent many years helping patients from all over the world resolve complex vision issues.